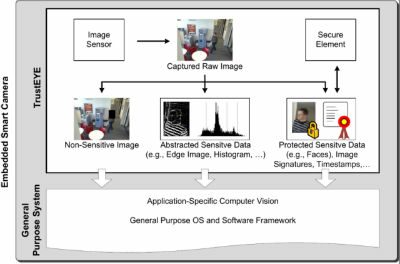 The emerging research area of visual sensor networks (VSNs) combines concepts from sensor networks, embedded computing and computer vision. VSNs are comprised of embedded smart cameras which perform onboard image analysis and spontaneously collaborate with other smart cameras in the network to jointly solve given tasks. We expect that VSNs will play an important role for several applications including assisted living, entertainment and surveillance. In most of these applications, sensitive personal data is captured and analyzed. There do exist a few, partial approaches towards security and privacy protection in VSNs, but systematically establishing a secure and privacy-preserving VSN is still an open research question. The strong resource limitations, the dynamic data analysis and the spontaneous collaboration pattern among camera nodes are the main reasons for the lack of holistic security and privacy protection. The fundamental hypothesis of this research is that trust in resource-limited VSNs can be established by making security and privacy protection inherent properties of the image sensing unit. The key idea is to “protect” access to the sensor and encapsulate dedicated security and privacy functionality in a TrustEYE—a secure sensing unit embedded on the smart camera. The TrustEYE has exclusive access to the image sensor's raw data. It separates sensitive from non-sensitive data by applying dedicated image analysis and ensures that only non-sensitive data is made available to the camera host system. Furthermore, the TrustEYE provides integrity, authenticity, freshness and timestamping guarantees based on cryptographic techniques. This approach clearly separates privacy protection and security functionality from application code. Application developers only get access to pre-processed and protected data. Thus, security and privacy protection are no longer in the sole responsibility of application developers. The TrustEYE also serves as key component for securing the spontaneous exchange of camera data among the camera nodes in the VSN. This trustworthy collaboration expands the core security guarantees from the node to the network level. An important advantage of our TrustEYE-based collaboration approach is that the size of the trusted software base can be considerably reduced and stronger security guarantees can be achieved compared to a pure software solution. Our trustworthy sensing and collaboration advances the current state of research in at least three areas. First, a major novelty lies in the protected sensor access and the clear separation between trusted and unprotected components. Second, TrustEYE additionally incorporates strong confidentiality and privacy protection techniques as closely as possible to the sensor. Finally, the secure TrustEYE unit enables the spontaneous establishment of secure and trustworthy data exchange among the spatially distributed cameras of a VSN. utility tradeoff of different protection techniques. component without imposing severe limitations on applications running on the camera. • Retain flexibility of the TrustEYE component without compromising security. • Using the TrustEYE component to establish trustworthy inter-camera cooperation.